Psychographs starts and ends nowhere. The complex floor plan of the ACG Art Center made it hard to lay the works out in relation to each other in the traditional linear way, explained Megakles Rogakos, who worked with Pelagia Kyriazi in putting the exhibition together. 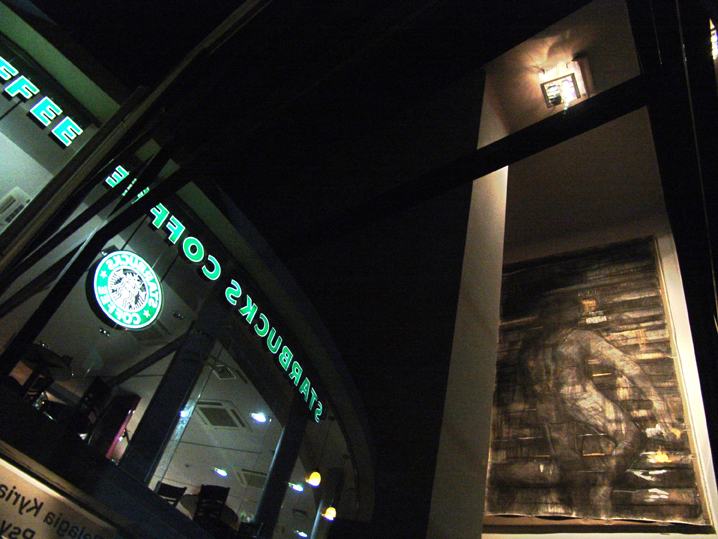 So instead, they placed each piece, or collection of pieces, where it fit best in the building. That suits Kyriazi's art just fine. "The evolution of the artist may be summed up as an endless search into the soul's ever-varied dimensions on a multitude of levels," explained Megakles. Kyriazi's work slides ceaselessly through the subconscious, revealing a world where hope endures a suffocating threnody. This is most evident in the Tyranny of Light video and Psychographs slide series, projected in a cavernous room on the ground floor of the ACG Art Center. The room encases the mood of psychological entrapment created by the artwork and the poem from which Tyranny of Light drew inspiration: The Windows, by Constantine P. Cavafy (1863-1933), who writes, "In these dark rooms, where I go through weary days, I wander back and forth looking for the windows." 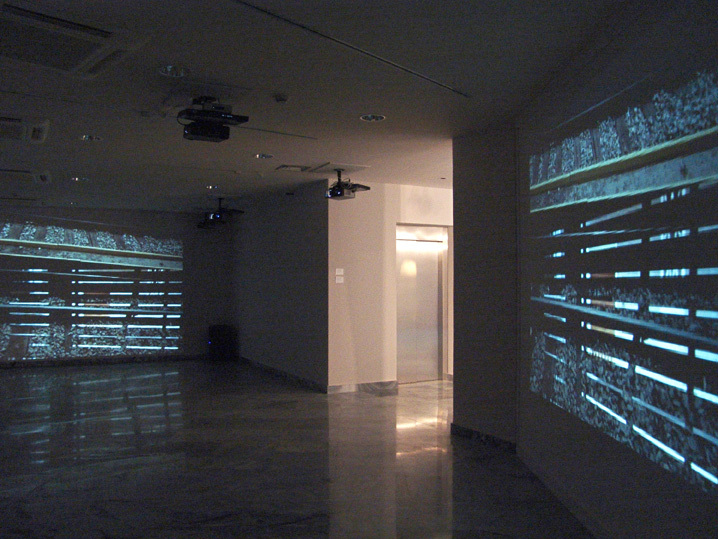 Kyriazi's use of multiple media techniques, including sound, in the production of the video, which took several years to complete, allowed her to build a labyrinth that taunts the viewer with hints of release, but leads to no exit; layers emerge, merge and fade away, indifferent to time, place and direction. Upstairs, where light floods into the ACG Art Center through large windows, the bright colors of Kyriazi's Submission and Crucible stand in contrast to the menacing dark monotony of Tyranny of Light and Psychographs. Yet there appears to be a thematic thread between them that would, were it not for the artist's willpower, yank Submission and Crucible right back down into the cavern from which they emerged. The Submission series, based on a photograph Kyriazi took of a piece of medieval stained glass depicting a hunting scene, contains "an emphasis on the act of submission," she writes. Yet in the psyche she reveals, it is never clear who is hunting, searching, dominating - and who is submitting. Perhaps this enigma, too painful to resolve, leads the artist to flee reality in order to free herself of despair. "I have stopped cultivating emotions but I will attempt an anatomy of fantasy," she writes. The fantasy of art may provide the psyche with a salving sense of unity and refuge in the world. Among the artist's thoughts on Crucible, a melting pot of colors, are the following: "delusions, a series of delusions, and then you no longer recall a thing, a series of aspirations... the entire world to be included, the entire world to fit in." This painting, writes Kyriazi, "does not represent something in particular. It represents everything." 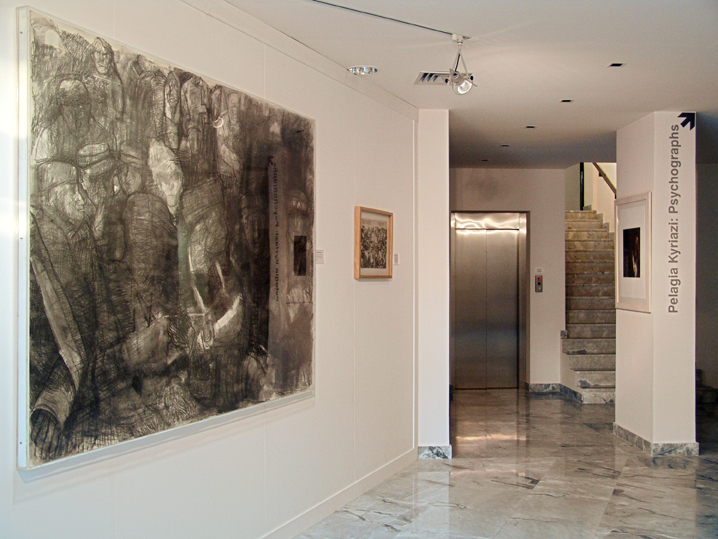 PS: Pelagia Kyriazi's Psychographs is open to the public Monday to Friday, through 16 December 2005. 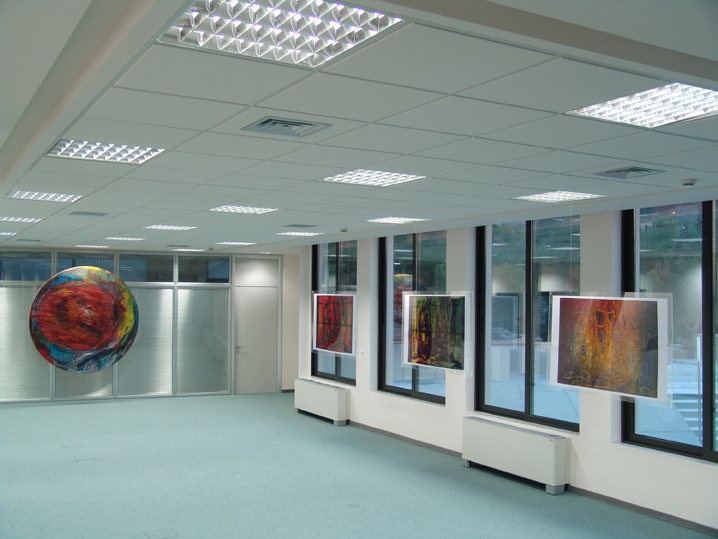 Galerie 3 in Athens is holding a parallel exhibition of Kyriazi's work.